In a small bowl, beat together the egg, milk, salt and pepper. Heat a small skillet over medium heat (preheat for 5 minutes), and add the eggs. Cook, stirring occasionally until fluffy and cooked through. Heat the ham -- you can either microwave it or warm it on the stove in a hot skillet. 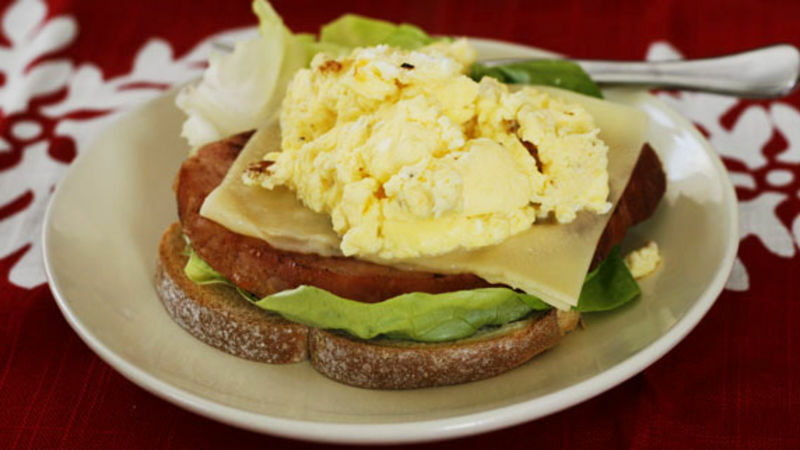 While the ham and egg are still hot, layer the toast, lettuce, ham, cheese (fold the slice to fit) and egg on a plate (in that order). Serve immediately -- and eat as you would an open face sandwich.